This is a brief guide which is meant to accompany a short walk around St. Michael’s Cil-y-Cwm. There are some pictures of the church above, but you will see far more if you come and look around, won’t you! 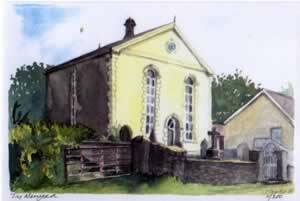 Welcome to the Parish Church of Cil-y-Cwm, dedicated my centuries ago to St. Michael. Take a walk with me around the church and the churchyard. It won’t take long and I will try and point out a few things that might be of interest. How old is it then? Isn’t that always the first question? What makes you think there is an easy answer? Often we fall back on calculated guess work or the opinion of ‘experts’. Sometimes there’s a real clue and here we just might be lucky! In 1291 there was a church document prepared (Taxatio Ecclesiastica Anglica at Walliae was it’s Latin name) and St. Michael’s doesn’t appear. Given that the church’s general features suggest most of it is about that old, the ‘expert’ opinion that the church’s origin was in ‘the years immediately after 1291’ starts to look good. Even that isn’t certain though, as only churches over a certain size were included anyway! This time and the for the next 100 years was ‘gold-rush’ time for churches in West Wales, they were going up like branches of Tescos! To know why a few sentences about the situation in the late 12th and 13th. Century in Wales. Ever since their arrival on the scene in Wales 100 years before the Normans were desperate to change things. They were horrified at the Welsh timber churches and the old ‘Celtic Church’ ways. They had long since got their hands on the Bishops’ jobs in Wales but the big push to ‘Latinise’ and ‘parochialism’ (a Roman Church idea) could only come with the final military victory against the Welsh Princes. That came in not far over the hills from here at Cilmary in 1278. Through the eyes of the Normans, Wales took a new lease of life after that, ‘new towns’ like nearby Llandovery prospered and stone churches appear in the valley and even hill parishes. Come with me now and stand in the main body of the church (the north nave) and lets look around. Ahead of us at the east end is the altar. Almost all churches are built east-west, with the altar at the east. The long axis always varies slightly. It’s said that on the day of the saint to whom the church is dedicated, a stake was driven into the earth and as the sun rose the shadow cast gave the orientation of the church. It sounds like the stuff of the Hollywood Producer, to test it you will have to come to Cil-y-Cwm early on the 29th of September! Turn west now and be prepared for a surprise. Instead of flat back wall we have a huge mass of masonry sticking into the body of the church. It’s the tower stairway. The tower (we should really call it the belfry) is said to be at least a 100 years newer than the church. Why the masons decided to project the stairway into the church and not build a ‘stair-turret on the outside of the tower, like many churches in the area, it’s hard to say. Fourteenth century ‘botch job’ or not, age lends quaintness! Eyes left now and look to the south. The five arcades are old and may be original. (It’s worth a peep into the south nave to see the lovely 15th C ‘wagon roof’ It has many interesting wooden bosses at timber intersections. I wonder if they are modern copies of older patterns removed with the old lathe and plaster, can you find the portcullis. The five lobed Tudor rose and five pointed star, ). Spare a thought for the massive building effort so long ago. Today we look at a church and find it interesting or charming. To people hundreds of years ago, it was literally vital to build the church. Where their souls were bound wasn’t a matter of life or death it was “far more important than that”. Some say the extra nave would be built to accommodate a rising population, but remember people stood in church in those days and they could have been ‘packed in’. We should not separate the building from it’s ancient functions. I think an extra aisle may well have been needed to process; a vital and frequent part of church life throughout the year’s course. Now for a curiosity. The most westerly arch has a huge piece missing and in the gap an ancient font. The font may be as old as the stone church. Looking at the masonry you might get the impression that is was purposely built as an integral part of the arch. Incidentally, the font is said to be ten sided. So many things in old churches were made to remind the people of the religious facts of life. Many examples of fonts show seven sides to signify the seven sacraments of the church. Should the ten sides here remind us of the Ten Commandments? As you leave the church and walk into the porch at the west end it’s worth turning round to look at the 15th century doorway. Also notice the bottom of the church west wall is splayed or ‘battered’. It was, presumably, the original west wall of the church before the tower was added. There is no doubt much that can be said about the outside of the church, but just walk around the building and take in the nature of the place, though glance at the gargoyles the window of the south nave east end, which have grimaced at passers by for over five hundred years. Notice also the old lime wash on the same end of the building. The site and the place is a very important facet of the nature of a church and particularly in ‘Celtic’ sites. You will notice a number of old yew trees in the church yard, with a particularly venerable specimen, said to be at least fifteen hundred years old. The yew is closely associated with old Celtic sites, and may well mean the site was of great importance to the people even prior to Christian practices, So by the way is St. Michael, it sometimes being said that Michael and all his angels were needed to counteract the influences of an old pagan site. Michael is a name associated with the Roman Church it may well have supplanted an older name of a Celtic saint when the stone church was built under Norman influence. I hope you have enjoyed this saunter around the church and it’s yard. Should you be interested I mention below a few books which might be worth a glance, and a few other churches of interest within a few miles of here. Of course much more could be said about the place, please forgive me confining my comments to a few notions that interest me. There are many churches and of some interest in the area, though not always open. If you are going up the valley to Llyn Brianne look in at Ystrad Ffin. The church of St. Paulinus (SN788470)is not ancient but the site just past the R.S.P.B reserve at Dinas is splendid. The dedication echoes a Celtic saint and a long-venerated site. If you are going into the National Park visit the lonely village of Llandeusant (SN777245) where there is a medieval church, St. Simon and St. Jude. The place is lovely and despite the Roman Church name the site is associated with the early days of St. David. If you’ve only time for one other church I’d suggest Llanfair ar y Bryn (SN769352), where there is the ‘bonus’ of seeing the Roman bricks in the wall, the church is within the site of a Roman Fort. 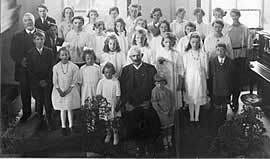 Rhodri Roderick , Tynwaun; Mari Lizzie Williams, Nantddu; May Williams (Giles), Cwmdunant; May James, Dinasbach; Lizzie Roderick, Tynwaun; Lily Harries, Dolachddu; Katy Harries, Dolgynon; Jones, Dinasbach Y Gof; Annie Jones, Lamb House; Eluned Jenkins, Ty Cornel (Police Station). 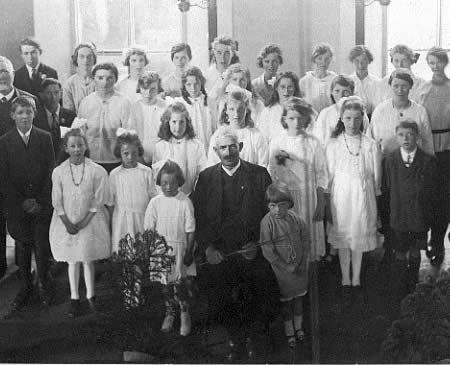 Morgan Williams, Glanrhyd; Lizzie Williams, Ochrfforest; Lily Williams, Cwmdunant; Rhonwen Jenkins, Ty Cornel; Mari Davies, Dugoedydd; Lizzie Williams, Glanrhyd; Davies, Cochmaen; Anne Davies, Moelfre. 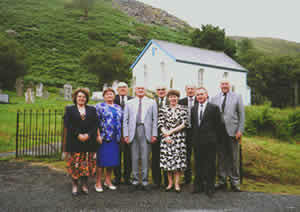 Front Row : Dai Davies, Dugoedydd; Sally Davies, Moelfre; Dory Theophilus; Eileen Davies, Derw House; Olwen Williams, Cwmdunant; Sally Davies, Dugoedydd; Mari Davies, Moelfre; Erwyd Jenkins, Ty Cornel. Nan Theophilus, Samuel Jenkins, Ty Cornel (Teacher); Eirlys Jenkins. The first service by Independents in the village was held around 1852, in a house known as Holborn House. Leading the worship were Mr Rees, Bethel, Cynghordy and Mr Hughes who lived in Holborn House. 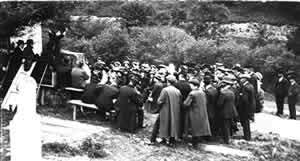 Immediately after this, the congregation moved to a house with a thatched roof behind the chapel, and probably on the site of the present chapel house. 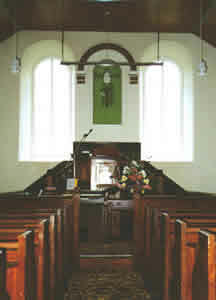 When the number of members increased to 60 following the 1859 revival, they decided to build a chapel. The land was given by Edward Pryce Lloyd, Glansefin, on a 99-year lease, and in 1872 the property was bought by W.H. Campbell Davys. 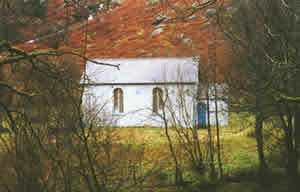 As you can see, this chapel is unique in that everything is exactly the same now as when the chapel was built in 1859. The pews are narrow and maybe uncomfortable, but this does have the advantage of keeping congregations awake. Look carefully at the emblem of the Cross on the wall. I think this is a very special work, and the artist – whoever he was – obviously put a lot of thought into his work. You will notice the Cross and all its relevant symbols surrounding it: the vine symbolising the Communion wine, the rose representing thorns, and the lily, which is symbolic of purity. Apparently, one of America’s most famous preachers, the Reverend Doctor I.D.E. Thomas, preached from this pulpit when he was a student. Born at Nantgwyn farm, Rhandir-mwyn, he became minister of one of the largest chapels in California, and a frequent contributor to BBC Wales news programmes.